Are you ready for some wintertime fun? We hear a lot of people complain about the snow and cold. I’m one of those people some days. The post-holiday blues are a thing and January and February can seem like the longest months of the year… January 74th anyone?? But, family fun can be found everywhere if you know where to look! Lake Country Family Fun believes in finding family fun 365 days a year, even in January and February!! So, if you’re looking for ideas and inspiration for things to do in Lake Country and the Waukesha County area in the winter, this list is for you! Grab your kids (and maybe a brave grandparent), put a smile on your frozen face, and go enjoy the outdoors even in the wintertime! PS. All of these ice skating rinks and sledding hills are park/public land. Lake Country Family Fun will never post ice skating rinks or sledding hills that are on private property. Bundle up and have a great time in the snow or on the ice! If you are looking for winter fun in the Waukesha County or Lake Country area, look no further, this one is for you! Ski, Ice Skate, Sled, Snowmobile and more! Birch & Banyan Coffee will be celebrating two years in business this spring. We’re located in the Village of Hartland, with convenient street parking and our own parking lot. As Lake Country’s newest coffeeshop, we aim to bring the highest quality possible to our drinks, while also making you feel comfortable and part of our family. We work with many local vendors, including Sally’s Sweet Shoppe, Anodyne Coffee Roasters, Rishi Tea, Sentry, Piggly Wiggly, and The Soup Market. Whether you’re looking to host a meeting in our private conference room, cozy up with a book by the fireplace, or catch up with friends in our bay window, we’re your place. This winter we’re featuring a few seasonal specials, such as hazelnut chai and creme brûlée lattes, along with our classic coffees, lattes, and more. Nothing says winter in Wisconsin like ice skating outside! Find outdoor ice skating rinks at Waukesha County parks and other local parks located throughout Lake Country. A 39-acre park located on the northwest corner of STH 83 and Oakwood Road in Delafield. The ice skating rink is 52 feet x 100 feet. There are two hockey goals available. It is free to use and has a portable restroom and benches. Users must bring their own skates and are encouraged to wear helmets and other protective equipment such as elbow pads, knee pads and wrist guards. A 15-acre park located in the north central part of Muskego: W167S7650 Parkland Drive, Muskego. A pond on the park’s south end provides ice skating during the winter months. Civic Center Ice Rink – CURRENTLY CLOSED DUE TO VANDALISM DAMAGE. N64 W23760 Main Street, Sussex. Open for 2018-2019 winter season. Please bring your own ice skates. No skate rentals are available at this time. Hockey is allowed, but please be respectful of others using the rink. Sundays, 1 pm to 4 pm. A 10-acre community park located on the eastern shore of Fowler Lake central Oconomowoc: 500 Oakwood Ave., Oconomowoc. Access from Municipal Lot by fishing pier. Here is a video about the City of Oconomowoc’s Ice Rink grooming from 2016. Currently, cleared for 2019 ice skating (about 8-9 inches) at Chili Fest! Not yet cleared for ice skating in 2019 season. Hopefully open the last week of January. The ice rink at Village Park in Eagle is not yet open for the 2018-2019 winter season. When it is, it will be skate at your own risk. Must bring your own skates and equipment. Dates of operation will be dependent on the weather. Sometimes winter weather doesn’t cooperate to ice skate outside. It can be too warm or too cold or the worst – rainy! Luckily, there are many indoor ice skating rinks in the Lake Country and Waukesha County area for your family to enjoy! Click this LINK for public skate times. 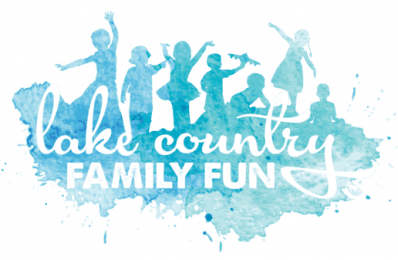 To see Lake Country Family Fun’s guest contributor’s experience, click here. Sledding is by far our favorite! Our family is lucky to live on a hill, so we just slide down our backyard – but there are many public sledding hills throughout the area, including a toboggan run at Lowell Park in Waukesha. See Lake Country Family Fun’s Sledding Guide for all the details. My husband is an avid snowmobile fan. He takes multiple trips in the winter to northern WI and Upper Michigan, but loves it the best when we can snowmobile at home. As of February 2, 2019 the trails are CLOSED in Jefferson county. Waukesha county is closing at midnight on 2/2. Walworth county is closing on Sunday, February 3 at 4:00 am. You can only snowmobile when the trails are open. Trails are publicly and privately funded and volunteer maintained by local snowmobile clubs. Consider joining a local club or attending a local fundraiser if you enjoy snowmobiling, too. Find a local snowmobile club here. For trail conditions call the Waukesha County Snowmobile Association’s Hotline at (414) 299-0330. For trail conditions call the Jefferson County Snowmobile Alliance hotline at (920) 699-SNOW. For trail conditions call the Walworth County Snowmobile Alliance hotline at (262) 742-2664. For trail conditions call the Dodge County hotline at (920) 386-3705. See our Kitty Cat fun on Instagram here. See our sled riding fun from January 2019 on Instagram here. There may not be any mountains in Wisconsin, but that doesn’t mean that you have to hop a plane to downhill ski or snowboard. Find many ski hills within an hour of Lake Country. Ausblick is a private ski hill in Sussex. Families can purchase memberships and bring guests. Patrons can ski or snowboard. Little Switzerland is open to the public. Guests can purchase season passes or daily passes. Heiliger Huegel Ski Club offers a family-friendly private ski club experience. Sunburst Winter Sports Park offers the public snowboarding, skiing, and tubing. Alpine Valley Resort offers the public a skiing hill and skiing lessons for children and adults. The Rock Snow Park offers guests skiing, snowboarding, and snow tubing. The Mountain Top offers guests 20 downhill ski runs for children and adults. Cascade Mountain offers guests downhill skiing and snow tubing. How would we get through winter, without awesome winter events? Don’t miss this family friendly winter events to chase the blues away! Come enjoy YMCA Camp MacLean’s toboggan slide Sunday afternoons from 12:30pm to 5:00pm, every Sunday between January 6th and February 24th, 2019. So much family fun crammed into one winter weekend! Plus, who can say no to fireworks in the winter? !